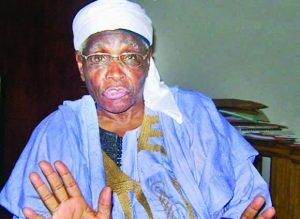 Professor Ango Abdullahi, is a former Vice Chancellor of Ahmadu Bello University, Zaria and a chieftain of the Northern Elders Forum. In this interview with SATURDAY SUN in Bauchi, the elder statesman speaks on the economic meltdown in the country and the suffering of the citizens. Ango also shares his views about the economic policies of President Muhammadu Buhari-led administration and expresses the pessimism that such would take Nigeria out of recession. On the fight against corruption, he argues that the president must keep to his words by ensuring that ministers in his cabinet and those in the corridors of power found involved in corrupt acts are not spared in the ongoing war against graft.. He spoke further with PAUL ORUDE on this and more. What has been going on in the country, let me start from 1999 till date, I always like to take a holistic view of issues particularly when you are talking of government in Nigeria. There are three tiers government in the Nigerian State. There is the federal government, the state and the local government. Looking at the constitution, you will find responsibilities that are either concurrent, meaning all the tiers or two tiers will partake in them-and there are some on the exclusive list, meaning that the federal has certain specific responsibilities that it could not share with the states. For example, the issues of security of the country, currency, foreign policy and so on and so forth. So, when you look at the country, particularly when you look at the issues around what the people are saying or their complaints and so on I am sure we will probably ask specific questions on that. But if I have to limit my comments on what the federal government has achieved so far or what it has not achieved; I would say there are a few areas of minus and a few areas of plus. If for instance, you the issue of security even though we are not done with Boko Haram, I think there is evidence on ground that the Boko Haram insurgency has been significantly degraded to the extent that they are not in control of any area of Nigeria that they can call their caliphate and so on and so forth. But then, you can say that there are still issues relating to security, some are new and some are continuing. Boko Haram is continuing in the sense that they are still attacking our troops, in ambush style and we are also not done yet with the issue of the Chibok girls and the internally displaced persons. All these are related to security. Of course you can also look at security concerns around the country generally. Kidnapping for ransom is becoming rampant and of course, there are new developments in the areas of security. The Niger Delta militancy has resurged and for whatever reasons, they are destroying vital assets belonging to Nigerian state. So here, the Federal Government obviously with full responsibility and so on is also looking into the Niger Delta militancy. There, one can perhaps say yes, they are engaging in dialogue with the elders and the militants themselves but this is an area I feel the federal government is unnecessarily slow. While they are talking to the elders, the militants are saying that the elders don’t even represent them and they are raising the stakes by continued destruction of public assets particularly those concerned with oil production and oil exports. Well, we hope that the federal government will continue in that effort to eliminate or to reduce significantly, the negative impact of the Niger Delta militancy particularly in terms of oil production, oil export, by implication revenue from oil that the government of the country largely depends on for now. Many are worried by the claim that the fight against corruption by the administration of President Buhari is one-sided; only targeting members of the opposition even when there are allegations of corrupt practices against APC members and some of Buhari’s ministers. What is your view? In the area of corruption, there is a lot going on. The Federal Government has intensified efforts to bring to book, those who have more or less stolen our common heritage and I think in this front, most people agree that government should be given credit for it. People are saying only one group is being targeted. I don’t know but if you take what happened between 1999 and now, strictly speaking, it is PDP-led government. And if there is a blame about corruption, about stealing of public property and so on, it rests largely on people managing the affairs of the country who happened to belong to one political party. So, it would not be surprising if in terms of proportion of people that are being investigated, or are being arraigned in court for corruption, that most of them are from the PDP. I don’t think it is true to say this is exclusively against the PDP members. That is not quite true. Those of you reporting to the Nigerian public know that there are so many people that, having been close to the corridors of power, are being investigated or being asked to cough out money and so on and so forth. On balancing, the Buhari administration has earned quite a lot of credit in its efforts to fight corruption but that war is far from being won. Corruption is still going on. In fact, some people said in some locations it is even on a bigger scale than we have seen before but I hope the president will keep his word that anybody caught will be dealt with irrespective of his relationship with the corridors of power, individuals within government and so on. We have seen quite a lot of this exchange between groups, between individuals that claimed that they are being targeted. If you look at the PDP players before 2015 and look at the players on ground today, thay are either working where they are, they are still there. Quite a lot of them claiming to be APC now until recently were all card carrying members of the PDP. So this is where the president has to keep his head above waters to make sure really he tracks down corrupt people irrespective of what stuff they come from or irrespective of whether they are now card carrying members of his party. We just wait to see whether from what we read in the papers some of his ministers are being accused of corruption are also probed. He demanded for proofs and in some cases, efforts are being made to provide proofs. What is your view on the hardship Nigerians are going through under the current administration? One of the aspects I disagree with the current administration is the devaluation of the naira. That devaluation really and the way it has happened, the way naira is today, I see very little room for the recovery from the recession for now. I see little room for now. It is a major policy decision that has brought us immense suffering. Of course, there are other campaign promises that have to do with the welfare of Nigerians which the president has alluded to during his campaign, for example, oil and so on, he said Nigerians would soon buy from pumping stations, a litre of petrol for not more than 50 naira and now officially selling for N145 and there is a clamour for a rise in the price. These are areas I feel strongly about. I feel strongly about borrowing money, particularly, the rate of the dollar in relation to the naira, short term and long term. The recession definitely is on ground but the efforts that are being made to mitigate the causes of recession are not adequate and this has to do with the monetary policies I talk about, exchange rate, exports and what have you. What is your take on the recent budget padding scandal? I think there is a lot of misunderstanding and uproar about the alleged budget padding. The law is clear on procedures for making budgets in the country. What the president does with his team in the executive branch is to make proposals to the authority that has the final responsibility for producing the budget. What the president lays on the table is the appropriation bill, it is not a budget. It only becomes a budget when the National Assembly does its job by looking into the details provided by the executive and it has the power to raise figures, lower figures, introduce certain elements into the proposal and once it approves. Until both of them agree in terms of what is in the appropriation bill, it is never a budget. This budget padding is a corrupt innovation which in fact is more from the executive branch than it is to some extent from the National Assembly. If you notice, before the appropriation bill, the ministers of government go to the assembly to lobby, they go to their respective senators or members of House of Rep, Permanent Secretary or Director or somebody in charge of a particular parastatal and so on. They go to lobby for their agency or ministry or for a particularly project so that when the issues are debated, they get the benefit of lobby with figures going higher than the executive is prepared to give. I see these issues as our attitude towards corrupt practices. You see, largely directors, permanent secretaries and so on, prepare the appropriation bill that is usually proposed by the executive branch. This is what we call top bottom approach to planning because I have not seen any senate committee on various aspects of economy and so on go round the country during the debate for budget or during proposals for budget particularly the executive doesn’t go anywhere to go and find out exactly what people want rather than sit down and make proposals on behalf of the people they have not talked to. So I think that overall, what came out of this controversy is failure on both sides-the executive branch as well as the legislative branch because they should be in contact with the various areas of needs of the country. If people are the object of their budget then the people must be involved in the processes that eventually produce the budget itself. The Senate President Dr Bukola Saraki is undergoing trial at the Code of Conduct Tribunal (CCT) over assets declaration. What is your take on this? Well, first of all, I like to feel that the CCT is supposed to be a judicial function and if it is a judicial function, what business has it, that it is under the office of the Secretary to the Government of the Federation? Right from the beginning, CCT is not an independent judicial arm of our judiciary because if they have judicial functions as many of these courts as pronounced that they are a court of litigation, a court of prosecution, a court that could sentence, obviously they shouldn’t be under the control of any executive arm of government because this court is under the control of the SGF. So, you wouldn’t be surprised if politics is brought into the picture like what you are seeing now in the case of the senate president. The allegation or rather the case against the senate president is exactly the same case that Tinubu had with the Code of Conduct Bureau. It doesn’t matter whether it was 100 years ago, whether yesterday but it is the same. If Tinubu could be freed on the basis that the judge, look at it again, the same judge that tried Tinubu on his failure to declare asset properly is the same judge that is presiding over Saraki, made pronouncement that he made a mistake the last time. In fact, he has already pronounced that he made a mistake in the case of Tinubu and he would not make a mistake on this. Obviously, the indication is that they want to convict Saraki on this. So, I see Saraki’s engagement with the Code of Conduct bureau purely on the basis of political differences between individuals within APC. And that’s all that there is, to it-politics. Talking about political differences in the APC, there are reports of re-alignment going on in the country and we hear reports that Tinubu, Atiku and some APC leaders are planning to breakaway from the APC and form a new party. How do you see this? Nigerians are always free to associate and form political groups and so on. If you look at the history of Tinubu and Atiku, they have been involved at various times in forming political associations and political parties and so on. So, if today, they feel that they want to form another party it is within their rights to do so. And of course the only thing you can say here is that you must suspect that something is going wrong with the leadership of the APC. There are so many cracks and looks like a lot of these cracks may not be cemented together and if they fail to cement these cracks together then the chances of what happened to PDP is likely to happen to the APC and therefore some of the members are proactive and are thinking ahead in case they cannot resolve their differences, they have to find new political platform and the new political platforms must be political parties that can contest elections. Recently, the president’s wife Hajia Aisha Buhari cried out about a cabal running the government. What is your view on this? I can look at it from two angles-those who are looking at it from the angle of family. Buhari family will say no since his wife has no official function and she has no particular assignment or national assignment against which people can comment on her performance and so on then I will leave it at the level of the family. But she cried out on the various appointments that her husband made over the past year or so and was able to say that those who are managing affairs substantially were people that were hardly seen as active members of the APC. Some of them don’t even have membership cards of the party. But if you look at it strictly, the constitution of this country provides that the president has the power to appoint personal staff like the Chief of Staff, Secretary to the Government and so on. It is absolutely within his rights. On the other hand, he is the one to ask himself whether the people he chose are people that will be able to carry out his campaign promises as competent ministers, as competent officials at one level or the other. It is the observation of the wife. And of course I made this comment sometime ago and it is just that by coincidence Buhari has repeated more or less what I said. Here is a president with a lot of integrity, competence but unfortunately he kicked off by not getting the right pegs in the right holes, whether they are round or square or whatever. And I think what his wife said is to a large extent true and then whether she should come out as a wife or family member and so on but she as an individual again, not as a wife but a woman citizen of Nigeria with the rights to pronounce even on herself let alone somebody else then it is within her rights to say so but the other consideration whether she is morally correct or to publicly take on her husband in terms of his failures or so is something else. Donald Trump won the US presidential election against the prediction of political pundits and pollstar. His victory shocked the world even as critics are quick to point out that he came to power through populist sentiments of Islam phobia and racism. What is your take? My basic reaction is to say I am totally disappointed by the American electorate, totally disappointed. This is a country that talks about democracy around the world, and talks about levels of morality around the world and profess whatever it is that they claim to be democratic and this is their platform in arguing or fighting against other systems like Socialism, Communism and so on. So, to me really, this election has portrayed the American system, more so the American public as totally uninformed about the world itself and I think this is what in most recent years, the Americans have succeeded in doing. They succeeded in frightening the uninformed American citizens that there is some evil coming. We saw it during the Bush administration and the bombing of the New York Twin Tower. This is all what was campaigned to Americans that America is not safe until they elect so and so. This is what is happening. I am really surprised at the level of education and so called sophistication of the American populace to declare Trump as the winner of the US presidential election against every indicator that common sense will say no to. So, they really have a problem. The American people have a problem. They really can’t force the world anymore as they perhaps try to do before. Their officers and system have to be acceptable to other societies around the world and for them to continue to play the leadership role they have been claiming in the world. For me, they have lost their leadership role in the world and I will be surprised if they will retain the headquarters of the United Nations in the United States because I mean this is not a country that feels that they are part of the world and their leaders like Trump if this is leadership in America, then there is no more leadership that warrants any part of the world to relate positively with the United States. What do you think about the person of the President-elect Donald Trump? He is a trump. I mean, first he appears ignorant. He has never worked in the public service and he had no exposure anywhere around the world. Then he sits there and I think he is being guided by the American establishment, the corporate system is what really brought Trump. You know American economy usually derives its sustenance from wars and that is why perhaps, Trump is in office now. To drag many parts of the world that have been peaceful into war so that they can go and destroy property and assets in those countries like they are doing now in Syria and hoping that their companies will get the contracts to rebuild these countries. It is the countries that eventually will pay for all the damages they have caused. This is what is happening in Libya today. What is happening is Syria and Iraq is there, Afghanistan is there. I think it is really a shame that the Americans find Trump worthy of leading them in this world that is competitive and sophisticated one. This is not a world for Trump to succeed. So in a very short while, I predict that the American system not only political but economic system will slide and Americans will no longer be the number one economy or nation in the world. China will take over. What do you make of the protests across America over Trump’s election? They have had elections before where people have won but I think this one must have really angered quite a lot of enlightened opinion in the United States. To me, that may be the reason for the protests. What should Nigeria’s foreign policy towards US be now? Nigeria has no foreign policy. It plays balls with those who care to play with it. There is nothing that you can say is Nigeria’s foreign policy. Foreign policy of most countries is that their national interest is first and I cannot see that in Nigeria today, not just today but for years. In fact, from 1999, the Nigerian government has abandoned its responsibility of being in charge of the economy and ensuring that the resources are exploited, harnessed and used for the benefits of the citizens. Go and read chapter two of the Constitution you see the primary responsibility. But we have surrendered the economy of Nigeria to foreign government and foreign bodies and they are telling us what to do. When Buhari came to power for example, many times he was interviewed by foreign journalists away from this country asking about the naira and he said he would never devalue the naira or borrow. But what have we got now? For us to say that for me to buy one dollar I have to get N450. Only 30 years ago I paid two naira to get three dollars, 1986. That was my last year in office as Vice Chancellor. I gave one N12, 000 cheque to my bank and the bank manger sent to me ten thousand pounds sterling as I was travelling out of the country as foreign exchange. This is one naira twenty kobo to one pound sterling. Now to buy one pound sterling you need N600 to N670. Can you believe this? Can you put it in your mind? There is no way Nigeria is going forward with this. Any suggestion on the way out? Of course there is. If you look at the 2016 budget, 70 per cent of it is recurrent, only 30 per cent is capital. Recurrent means salaries and allowances of public officers. You tell me. You should be able to tell me whether these public services have really to produce the products that the Nigerian citizens will say this is the output from their resources. We have no power for 50 years. Nigeria cannot boast of 5, 000 megawatts of electricity. Our roads are in bad conditions, our hospitals are in shambles, our schools are in decline and so on and yet there is a budget every year where public officers are paid. So my conclusion here is that because the public services are so unproductive, because we are supposed to pay for everything, it doesn’t deserve 70 per cent of our budget. If there is any serious step in government to address this issue they should go back to the 2016 budget, the recurrent budget and ask themselves, is this really a fair investment of the Nigeria state in a sector that is unproductive? So my recommendation is to go ahead and say 50 per cent of the budget is transferred to the capital budget. There are two options. One is difficult and I would not recommend it, that you sack 50 per cent of your work force because it is unproductive any way. But rather than do that you look at the possibility of reducing salary by 50 per cent. In some cases, for anybody earning above N50, 000 he deserves to lose some part of his salary. But the higher you go the more until you hit at least 50 per cent or more because there is no justification that somebody will be sitting in the senate and collecting N30 million when this country is saying they cannot pay the minimum wage of N18, 000 a month. So, for me the unproductive nature of the public service has to be addressed to be able to address serious issues. Of course, the allocation of resources has failed in the 2016 budget. Because in their campaigns the so called economic advisers said the agriculture sector is going to be in place of the oil sector or is going to be the sector that will be used to recover the economy. And what did the agricultural sector get in the 2016 budget? 1.2 per cent is the sector that produces 45 per cent of our GDP, it got 1.2 per cent allocation. The contradictions there are so obvious and it looks as if we are just back into talk show here and by the time we finish talking, very little will be done.